The Prophets’ conception of universal and comprehensive justice is reflected in the teachings of Noah, Abraham and Moses, and is connected to transcendent source of the rules prescribed by the Creator of all for all humanity, and became an exclusive conception focused on social and economic justice. Justice was particularized to the same areas as was the case in Mesopotamia, to protect the rights of the debtor, poor, widows and orphans. 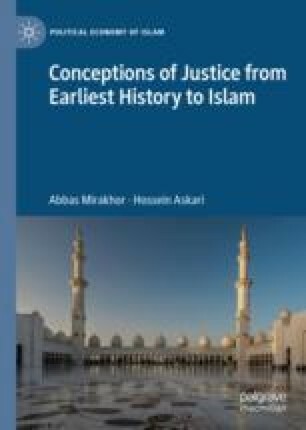 One major difference between the Mesopotamian and Bani Israel conceptions was that the latter now included demand for justice to be applied to rulers and judges. The prophets saw justice as the result of compliance with the laws of the Creator (God of Justice, who hates robbery and inequity and who manifests his holiness through justice and righteousness) and the very essence of piety.